Mum, my Bermondsey Belle, was a titan of a woman who made an impression wherever she went – tall, glamorous, tough and never afraid to voice an opinion. Duchess loved her food and never let a diet, a fad or a whim stop her from indulging in a good meal. 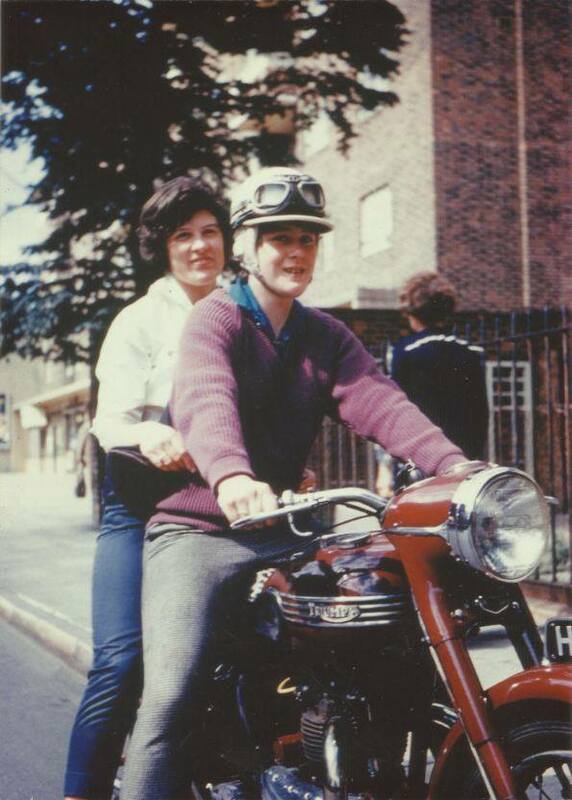 Mum on her twin-engine Triumph in Bermondsey in the 1960s. Growing up, my best friends were twins and we did everything together and mum always kept the house open to welcome them with a cheap but tasty meal. One day things got a little out of hand and we started to a food fight in the new dining room, mum’s pride and joy. When she walked in we were terrified of her reaction – she was fiery and tempestuous and you never knew what to expect. There we were expecting a torrent of abuse (mum loved a good expletive) but what we got was something else. She strode in, surveyed the scene, walked to the table, scooped up a handful of dessert (jelly made with milk) and flung it at the twins. The food fight lasted another ten minutes, the communal clean up much, much longer. I miss my Bermondsey Belle. I’ve tinkered with this recipe for years in an effort to get it right. Potatoes are personal, this is my favourite with tips and tricks pulled from decades of practice. Simple, effortless and tried-and-tested. Feel free to monkey around, but I know this recipe works. Peel the potatoes and cut into three. The best cut is to cut a triangle in the middle. With two cuts, you get three potatoes with a flat surface. The flat surface is important. Drain and cool in a pan of fresh, cold water. After a few minutes, drain and let cool right down. In a hot oven (180C to 200C it depends on your oven but it needs to be hot), heat a roasting tin with a thin film of vegetable oil – no more than 0.25cm). I’ve tried duck fat, goose fat etc and I really don’t like the taste. It’s a personal choice, but vegetable oil heats smoothly and really does the job. The potatoes should enhance your dish not dominate it.Also don’t be tempted to add too much oil, doing so will drown the spuds and they won’t crisp. While the oil is heating, gently bash the potatoes in a pan to get the edges a little fluffy. After 15 minutes, put an apron on (you’ll need it), take the roasting tin out (it is going to be smoking hot) and throw in the potatoes. While they are making a ruckus, coat in the oil and then place smooth side down, shake the tin , sprinkle with salt and put them on the top shelf of the oven. After half an hour, turn the potatoes. After a further 20 mins check the potatoes, depending on your oven they might need another 10 or 20 minutes. These go really well with Red box roast chicken and on the rare occasion you have some left over, you should use them to add some oomph to George’s bubble and squeak. If you’re serving this with a plain roast, add the olives and rosemary five minutes before cooking time is up. Adding them this late keeps the intensity of the rosemary and the juiciness of the olives.